In the constellation of Auriga, and 5.4 billion light years away is a large galactic cluster known as MACS J0717.5+3745. It is being studied as part of the Massive Cluster Survey, which looks at galaxy clusters that are bright at x-ray wavelengths. 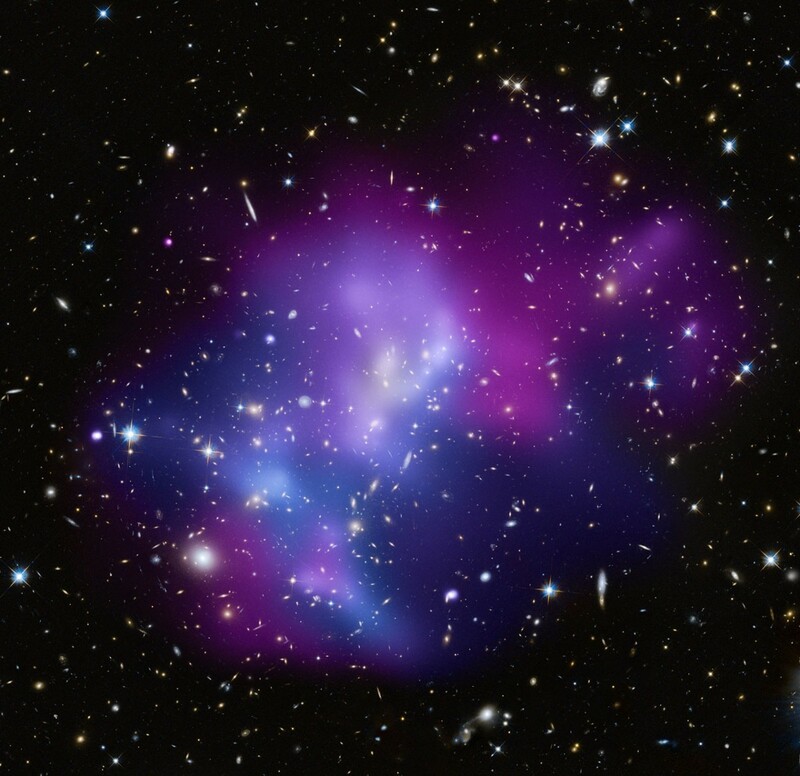 What makes this particular cluster interesting is that it is formed from the collision of four galaxy clusters. We’ve seen collisions of two clusters, such as the Bullet cluster, and these have helped us confirm that dark matter is a real thing. The Bullet Cluster consists of two groups of galaxies colliding into each other. 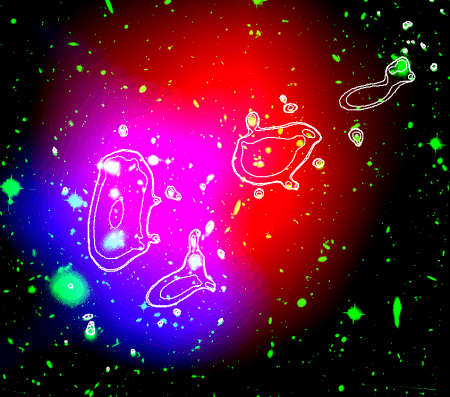 As they collide, the regular matter of the galaxies interact and are bunched together in the middle. It is kind of like two crowds of people moving in opposite directions and causing a packed crowd. Since the dark matter can pass through regular matter easily, it’s motion isn’t hindered. The dark matter from each group just passes through the pile up and on to the other side. So if dark matter is real, you would expect to see the regular matter from the galaxy groups bunch up in the middle, while the dark matter keeps going, right through the central matter and on to the other side. This is exactly what we see with the Bullet Cluster. Observation of the kinetic SV effect. Credit: P. Korngut. With the MACS J0717 cluster we have an opportunity to study more complex dynamics between matter and dark matter. Recently, astronomers were able to observe a new effect known as the Sunyaev–Zel’dovich effect (or SZ effect for short). The SZ effect is a distortion of the cosmic microwave background due to the high speed motion of material in the cluster. Low energy photons from the cosmic background collide with fast moving electrons. The photons are then scattered with a great deal of energy, thus changing their wavelength. We can see this as a shift in the wavelength distribution of the cosmic background in the region of the cluster. Usually the SZ effect is due to thermal motion of electrons (thermal SZ), but in this case it is due to the bulk motion of one of the clusters itself (kinetic SZ). Because the size of the effect is proportional to the speed of the cluster itself, we can use the SZ effect to measure the motion of the cluster. If we can measure this kinetic SZ effect in other distant galaxy clusters, we will have a better idea of the motion of galaxies in the Universe, which will in turn help us further refine our measure of cosmic parameters such as the Hubble constant. All from a galactic pile-up. 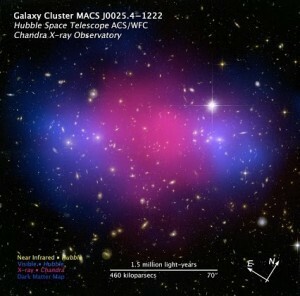 The impression of this cluster shows that dark energy may be the first energy in space. The presence of regular matters and dark matters and its interaction shows there is presence of gravitation force..will this gravitation force one day overcome force of dark energy.